Ships from and sold by PBShopUK-au TRACKED. Start reading Black Beauty on your Kindle in under a minute. 5.0 out of 5 starsLovely, quality book. Fantastic! Lovely quality book, great price, quick delivery. Exactly what I wanted, the cover is lovely and great for a gift. 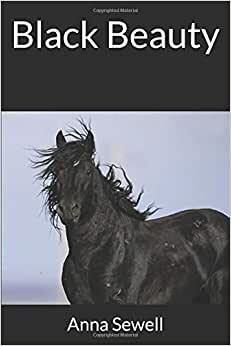 An all time classic which I read years ago and enjoyed again now I'm in my sixties and still own a pony - written from the horse's perspective A must read for any horse owner . The book is fine but it is the abridged version. I loved this book as a child so I bought it for my horse-loving granddaughter. But I failed to notice the size of this particular version - it's not a regular book shape, it's more like a magazine, big and flat. Which is weird - why did they print it this way? I got this book because i was forced to read it in school and didn't really remember it. I thought I would read a page and probably be done with it. But to my great surprise, I found it an amazing story from the horse's mouth. (Joke) Anyway it you've never read it or even read a long time ago, it is well worth the read or re-read! BLACK BEAUTY is an all-time classic children's story. It tells the tale of a horse named Black Beauty, from birth to old age. It's a gentle, easy-to-read book that will find favor with children of all ages, and those adults with a little child deep inside. One interesting aspect of the story is it's narrated by Black Beauty himself, so we get to see the world from the horse's point of view...and we don't come off well in many aspects. The story is fun on its own terms, but it also teaches consideration for all life, compassion for animals, and how important love and respect are in this world. Any child who hears this story and takes it to heart will become a better adult. "You are a very good man," said James. "I wish I may ever be like you." "I don't often speak of myself," said John, "but as you are going away from us out into the world to shift for yourself I'll just tell you how I look on these things. I was just as old as Joseph when my father and mother died of the fever within ten days of each other, and left me and my cripple sister Nelly alone in the world, without a relation that we could look to for help. I was a farmer's boy, not earning enough to keep myself, much less both of us, and she must have gone to the workhouse but for our mistress (Nelly calls her her angel, and she has good right to do so). She went and hired a room for her with old Widow Mallet, and she gave her knitting and needlework when she was able to do it; and when she was ill she sent her dinners and many nice, comfortable things, and was like a mother to her. Then the master he took me into the stable under old Norman, the coachman that was then. I had my food at the house and my bed in the loft, and a suit of clothes, and three shillings a week, so that I could help Nelly. Then there was Norman; he might have turned round and said at his age he could not be troubled with a raw boy from the plow-tail, but he was like a father to me, and took no end of pains with me. When the old man died some years after I stepped into his place, and now of course I have top wages, and can lay by for a rainy day or a sunny day, as it may happen, and Nelly is as happy as a bird. So you see, James, I am not the man that should turn up his nose at a little boy and vex a good, kind master. No, no! I shall miss you very much, James, but we shall pull through, and there's nothing like doing a kindness when 'tis put in your way, and I am glad I can do it." "No, indeed," said John, "where should I and Nelly have been if master and mistress and old Norman had only taken care of number one? Why, she in the workhouse and I hoeing turnips! Where would Black Beauty and Ginger have been if you had only thought of number one? why, roasted to death! No, Jim, no! that is a selfish, heathenish saying, whoever uses it; and any man who thinks he has nothing to do but take care of number one, why, it's a pity but what he had been drowned like a puppy or a kitten, before he got his eyes open; that's what I think," said John, with a very decided jerk of his head.